Although the concept of "steering" in quantum mechanics was proposed back in 1935, it is still not completely understood today. Steering refers to the ability of one system to nonlocally affect, or steer, another system's states through local measurements. The two systems are entangled, but it is an especially strong type of entanglement in which the systems are not just correlated, but correlated in a specific direction. Schrödinger originally proposed the concepts of entanglement and steering in response to a well-known Einstein-Podolsky-Rosen (EPR) paper that criticized quantum mechanics. Since then, steering has only been experimentally demonstrated using inequalities, which involve testing whether or not systems obey the local hidden state model. Entangled systems that can steer each other violate the steering inequalities because they do not obey the local hidden state model. A disadvantage of these demonstrations is that they usually require many measurement settings, which weakens the tests. In a new study published in Physical Review Letters, a team of physicists led by Professors Jin-Shi Xu and Chuan-Feng Li at the University of Science and Technology of China in Hefei; along with Jing-Ling Chen at Nankai University in Tianjin, China, and the National University of Singapore, have experimentally demonstrated EPR steering using a new method that requires fewer measurements and provides a stronger validation of steering. The new technique is based on an "all-versus-nothing" (AVN) proof for EPR steering, which does not require inequalities. Using this criteria, the researchers could verify whether states are steerable or not. "EPR steering exists between the concepts of entanglement and Bell non-locality; these steerable states are a subset of the entangled states and a superset of Bell nonlocal states," Xu told Phys.org. "Bell non-locality shows the conflict between the predictions of quantum mechanics and the local hidden variable theory. On the other hand, the AVN proof for EPR steering shows the conflict between the predictions of quantum mechanics and the local hidden state model. "In our work, the AVN proof for EPR steering for two-qubit entangled states employs the different pure normalized conditional states (NCS) in one qubit along with a given projective measurement on the other as a criterion. According to quantum mechanics, two different pure NCS should be obtained, while the local hidden state model predicts that one cannot obtain two different pure NCS when the other qubit is performed by a projective measurement. The AVN proof provides a direct contradiction between quantum mechanics and the local hidden state model, and it requires fewer measurement settings, which shows the advantage for demonstrating EPR steering." In addition to providing a stronger test of steering, the AVN test also demonstrates an effect of steering that has never been demonstrated before: that it is possible to store a system's state information in the system that is being steered. This result has practical applications, for example in long-distance quantum information processing. The scientists plan to pursue these applications in the future. "EPR steering could help us to understand the quantum non-locality comprehensively," Li said. 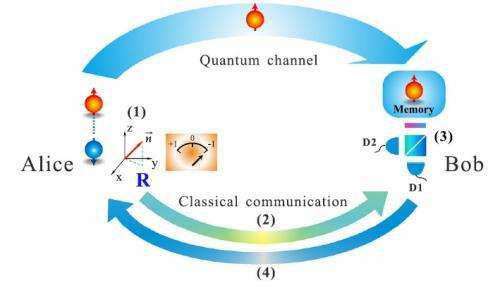 "And it can be used to implement the long-distance quantum state preparation and quantum key distribution. What's more, EPR steering is an asymmetric process, which is different from the concepts of Bell non-locality and entanglement. This feature would find critical applications especially in the tasks where asymmetry plays an important role."